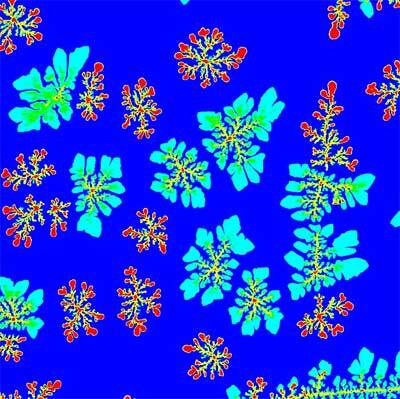 (Nanowerk Spotlight) While growth processes of nanostructures are well understood, the stability of artificial nanostructures has not been thoroughly investigated. Fully understanding the fluctuations of nanostructures and their interactions with their surroundings is essential in order to achieve complete shape control of nanostructures. In recent work, French scientists address the morphogenesis, instability and catastrophic collapse of nanostructures. The French researchers work on shape generation in islands grown from the deposition of preformed clusters opens new routes for investigating instabilities in nanostructures. These instabilities are induced by inner constraints within the grown nano-objects and not by those applied externally by the substrate. A paper about their findings, titled "Dynamics of Polymorphic Nanostructures: From Growth to Collapse" was published in the July 19, 2006 online edition of Nano Letters. Dr. Catherine Bréchignac, a physicist at the Clusters and Nanophysics Group at the Laboratoire Aimé Cotton at the Université Paris Sud, who earlier this year was named chairwoman of CNRS, the French National Center for Scientific Research, explained her group's recent work to Nanowerk: "By depositing preformed antinomy clusters on a cleaved graphite surface we generated unusual polymorphic nano-islands. We used these islands as test platforms for monitoring instabilities as a function of shape, size, mass and strain." "The nano-islands were of complex morphology with a high amount of accumulated strain and a reduced coupling with their substrate" says Bréchignac. "Interestingly, we observed spectacular shape transformations such as 3D to 2D collapses." Such a collapse can occur when the strain energy accumulated during the growth is large enough. Bréchignac notes that these unusual flattening 3D to 2D transitions in growth processes mimic at the nanoscale the sliding behaviors occurring at macroscopic levels ranging from the mechanical stress induced mechanisms of microtubule catastrophes to geological phenomena or. "These observations are new with respect to previous investigations" she says. "They constitute hints for the elaboration of models accounting for the genesis of flattening transitions, which should attract the interest of our theoretician colleagues in computer simulation and analytical modeling." The first one is to search for other examples implying different geometries, structures and compositions, in particular the role of structural and chemical defects in nanowires and quantum dots. The second one is to develop new instrumentation for monitoring these behaviors directly in situ in an electron microscope. The third one deals with the elaboration of more satisfactory theoretical models.